For the most demanding users who know no limits, this Swim Spa has a wonderful range of hydromassage features. Hypa Spa Buying a swimspa is a great choice for staying fit, or simply for focusing on your health, wellness and quality of life from your own home. Hypa Spa From expert athletes to enthusiasts and recreational users, the Swim Spa is a model with sophisticated features and high power. The swimspa is an absolutely groundbreaking concept, a fusion between wellness and fitness, between the usual activity of a hydromassage tub and a swimming pool or mini pool. The Swimspa models offered by Aquavia Spa are designed not only for counter-current swimming but also for other activities and physical exercises in the pool, popularly known as aqua gym. It is also a way to enjoy a real luxury: a swimming pool all year round. 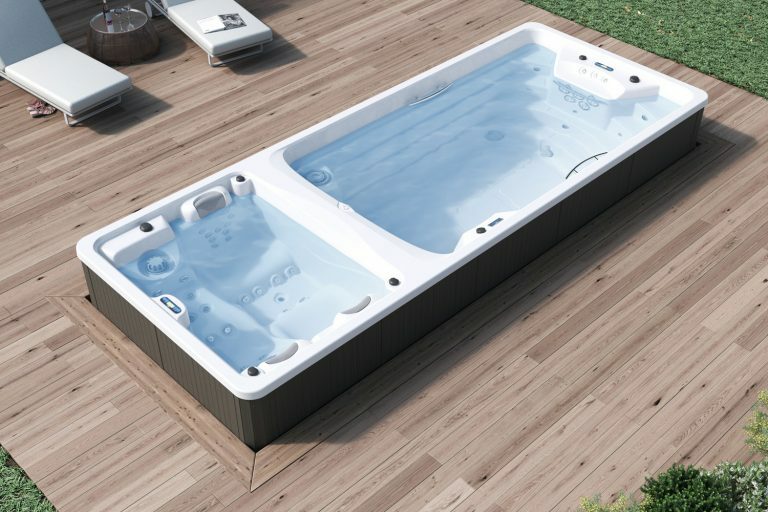 Portable, or with the option of being built into the ground or covered with any type of sports equipment, in gardens or on terraces, the Aquavia swimspa provides spectacular added value in terms of physical activity and health. It is an excellent investment for well-being and quality of life. The Amazon is a spectacular swimspa, combining a 3-person hydrotherapy zone and a swimming pool designed for non-stop counter-current swimming thanks to its large size (500 x 230 cm) and the power of its 5 turbojets, which create a counter-current at the speed selected by the user. Two completely separate areas, to allow some of you to enjoy the “swim” version while others enjoy the “hot tub” version; in other words, to allow sporting activity and total relaxation in one place, counter-current swimming or aqua fitness side by side with hydromassages.